Gift of Shirley Rosner Lukoff, November 1981 (transferred to the University Archives and Records Center, March 1992): additional gift of Shirley Rosner Lukoff to the University Archives, March 15, 1992. The papers of Herman Lukoff, a graduate of the University of Pennsylvania, are arranged in two series. They are Personal Papers, 1940-1979 (1 1/2 cubic ft.) and Professional Papers, 1949-1980 (5 cubic ft.). The Professional Papers consist of the following subseries: Correspondence, 1956-1979; Writings, 1949-1980; Patent Applications, 1949-1968; Computer Conferences, 1953-1976; Awards, 1969-1979. The majority of these subseries are arranged chronologically. Herman Lukoff, a pioneer in the computer industry, was born in Philadelphia on May 2, 1923. His parents were Aaron and Anna (Slemovitz) Lukoff. He received his early education in the Philadelphia public school system. At an early age he became interested in science, and when he was eleven, he built a two-tube radio following a diagram published in a Philadelphia newspaper. His interest in radios and electronics continued throughout his life. Lukoff followed his desire to work with electronics when he attended the Moore School of Electrical Engineering of the University of Pennsylvania from 1940 to 1943. He received the bachelor of science degree in electrical engineering in 1943. Just after graduation from the Moore School, Lukoff was chosen to join a new project which would shape the remainder of his career. In April of 1943 J. Presper Eckert and John W. Mauchly had begun working on the famous ENIAC computer project. Eckert and Mauchly were looking for a graduate with practical knowledge of radios to work with the them on the ENIAC and that summer they chose Lukoff. Lukoff worked with Eckert and Mauchly until June of 1944, when he was drafted into the navy. While in the navy he was assigned to duty in the South Pacific as a radio and radar maintenance engineer. Having completed his two-year tour in the navy, Lukoff embarked on his career in the computer industry. He returned to Philadelphia in 1946 to work at the Moore School with Eckert and Mauchly on the EDVAC computer. Here he helped to develop the electronic circuitry to control the mercury delay line acoustic storage, which was a major innovation of the EDVAC. When Eckert and Mauchly formed their own computer company in 1947, Lukoff joined them. Here he continued to work on the company’s many projects which advanced the computer beyond the ENIAC. Their next project was the BINAC computer, for which Lukoff had created the electronic control for the magnetic tape handler for input and output of data. Lukoff’s career blossomed after 1950 when the Eckert-Mauchly Corporation was bought out by Remington Rand (later known as Sperry Rand) Corporation. With the great resources of this large company at their disposal, Lukoff and his co-workers started work on the UNIVAC, the world’s first business data processing system to be produced by mass production techniques. In addition to working on many aspects of this important project, he continued to develop input-output devices. He created a unique logic and electronic circuit for controlling operations of the magnetic tape system as well as circuits that insured the reliable operation of the UNIVAC. In addition, Lukoff was also responsible for the production engineering of two auxiliary systemsñthat of the card to tape converter and the high speed printer. In September of 1955, Sperry Rand was awarded the contract to develop the first multiprocessor data processing system for the Lawrence Radiation Laboratory in Livermore, California. This was the first big computer project to be administered by Lukoff. The Univac-LARC (Livermore Automatic Research Computer) abandoned the radio tube for transistors and used a processor chip to control data flow from and to the storage system, thus allowing the machine to perform several operations at once at a high speed. In 1961, under Lukoff’s leadership the project was able to met all the specifications of the customer and the due date without any delays. Lukoff’s great success in the Univac-LARC project led to his appointment as manager of commercial engineering at Univac Engineering Center in Blue Bell, Pennsylvania in 1962. In this new position he directed all engineering operations, which included systems engineering, development of computer peripheral equipment, and Univac commercial research. During this period he directed the development of the Univac III and Univac 1050 data processing systems and the Fastrand I mass storage and the Uniservo III-C magnetic tape systems. Lukoff was also responsible for accelerating the research into ferrite core elements and plated wire technology. As a result of this research, the Univac division of Sperry Rand rapidly grew into one of the world’s largest manufacturing facilities for the production of magnetic cores. In addition to his technical and managerial work at Sperry-Rand Univac, Lukoff also made a number contributions to the scientific world. By 1969, he had accumulated ten patents for different computer systems. During the 1950s’ and 1960’s, Lukoff had written over ten articles which outline the pioneering work he had done in the field. 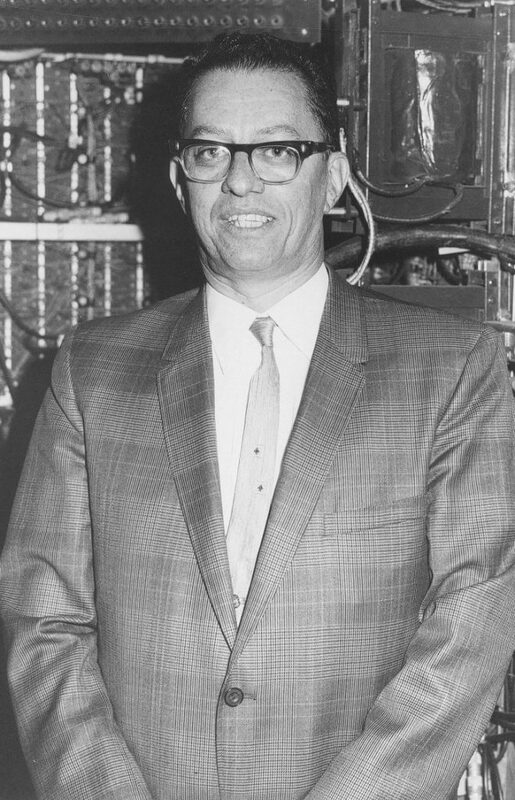 In 1969 in recognition of his major contributions to computer development, he received the prestigious W. Wallace McDowell Award from the Computer Group of the Institute of Electrical and Electronic Engineers. The following year Lukoff was named a fellow of the Institute. The last years of Lukoff’s life were spent working at Sperry Rand and working on his book From Dits to Bits: A Personal History of the Electronic Computer. From Dits to Bits was an autobiographical account of his experiences with the ground-breaking research and design of computers. Having passed away just a few months before his book would be available to the public, From Dits to Bits became a final testament to Lukoff’s important career. Herman Lukoff died on September 24, 1979 and was survived by his wife Shirley Rosner Lukoff and four children, Arthur, Barry, Andrew and Carol. Although there is a small series of personal papers, primarily containing student notes while attending the University of Pennsylvania, the papers of Herman Lukoff mainly document his professional career at the Sperry Rand Corporation. The professional papers contain a variety of material covering his almost 30 years of employment with the Univac division of Sperry Rand. The majority of the collection contains interoffice letters and memos that Lukoff had sent to his co-workers; they detail the development of the many computer projects in which he was engaged. There are very few letters which he received. In addition to his office correspondence, Lukoff’s research can be traced in the patents for projects to which he made major contributions, and the results of this research can be seen in Lukoff’s writing. There are copies, some in manuscript form, of his published articles, texts of his speeches, and presentations and reports he made for prospective clients. By far the most important part of the professional papers series are the files relating to Lukoff’s book From Dits to Bits. In additional to the original manuscript there are also several proofs, including one edited by Presper Eckert, one of Lukoff’s friends and co-inventor of the ENIAC. The reference material files that Lukoff compiled to assist him in writing the book contain letters, articles, and reports. There are also a number of photographs related to his work on and the history of the computer. Sperry Rand Corporation. Univac Division. Electrical Engineering, Class Notes, n.d.